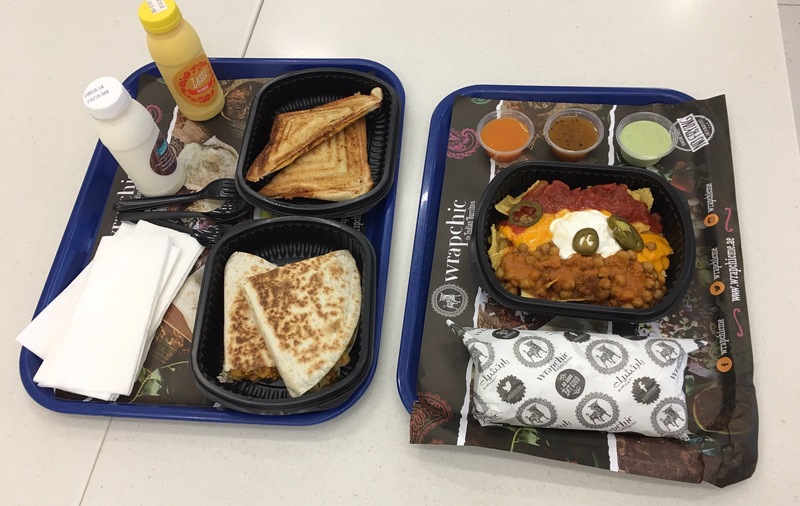 Being a huge lover of Indian and Mexican food, it was a pure joy when I came across Wrapchic-an Indian street food concept that has a blend of Indian and Mexican flavors. At Wrapchic you can expect Indian food that is served the Mexican way. Wrapchic is the world’s first eatery that wraps together all the delicious and colorful flavors of Indian street food into an easy to eat Mexican format. Founder of Wrapchic Mahesh Raikar, a well paid employee with a Fortune 500 company, quit his job to follow his passion to bring Indian food in a 21st century format. And as a result of his love for Indian and Mexican food, the concept of Wrapchic-‘The Indian Burrito Company’ was born. Wrapchic or Rap-Chik is an expression that conveys real satisfaction in the most cool way in the street lingo of Mumbai city. It’s a word that real Mumbaikars would use, when no other word would suffice. 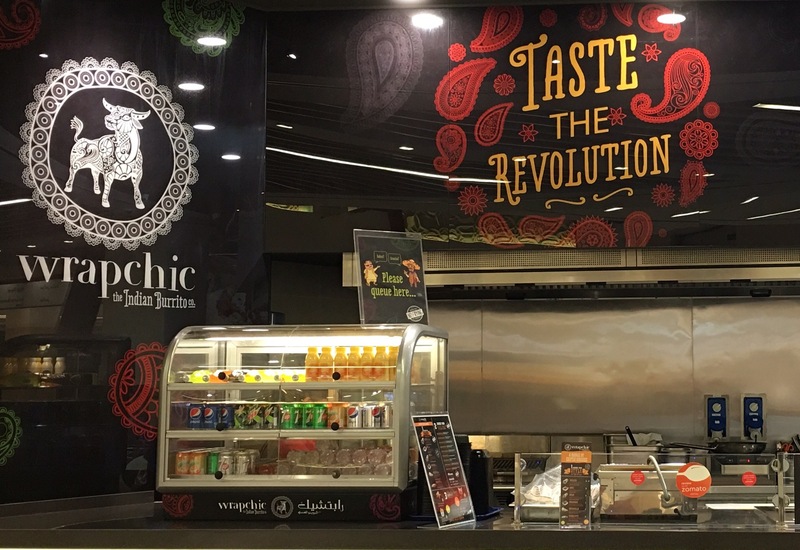 Wrapchic’s first outlet was opened five years ago in the city of Birmingham and now they have many outlets across U.K. Their Dubai outlet is the first one outside of U.K.
Their Dubai branch is located in the Food Court of Burjuman Centre. Easy to locate the outlet in the food court with it’s vibrant logo. The food at Wrapchic is made using the freshest and best ingredients. Everything in made in-store and their food is fresh, healthy, and tasty. Their menu is simple. First, you have to choose a style, like a burrito or wrap or quesadilla etc and then choose your fillings. They have a good selection of Indian fillings like chicken Mughlai, prawn Amritsari, mutton Hyderabadi, paneer masala and more. If you fancy a side to go with your meal there is the Wraposa and Wrapchos. As for the drinks, they have the regular soft drinks and sodas with traditional Indian yogurt or lassi with a choice of flavors like mango, coconut and strawberry. We tried the mango and coconut flavors, we especially loved the coconut lassi and comes totally recommended. Burrito, I loved the fact that it had whole wheat or white wheat option. It was a wholesome burrito with my choice of filling, plus Mexican rice, beans, salad and chutney. Wrapchos were the warm nachos topped with my choice of filling, sauce, Jalapeño, sour cream, cheese and salsa. It was amazing. Wraposa was one of the sides we ordered. It was a crisp toastie with a filling. I opted for the Bombay aloo filling and it was scrumptious. Quesadilla also comes with a whole wheat or white wheat tortilla option. It had flour tortilla folded and sealed with cheese, filling option of your choice, onions, peppers and tomatoes. I went for the paneer masala filling and oh boy! It tasted extremely delicious. This combo is a must-try. Overall, we enjoyed the food and can’t wait to go back and try their other exotic choices. Prev Jardin Majorelle In Marrakech-Is It Worth Visiting? sounds raapchik! 😉 must try it!